Illuminated by a long-life NSD 150 lamp, the Acme Eliminator 150 is an intelligent moving head suited in size to DJs, bands and installations. This powerful discharge 150W fixture has a very low price -considerably less than you might expect to pay for a comparable product with the same features. DMX addressing is made easy thanks to the on-board digital display, which is easy to operate with its four button menu system - one each for scrolling forward, scrolling backwards, selecting a function and exiting menus. The unit comes with in-built internal programmes, so it can also be run without a DMX controller in sound-active mode or linked in multiples as master/slave. Housed inside its ergonomic head is an array of 9 colours plus white and 6 replaceable rotating gobos (including 2 glass gobos). Gobos and colours are on independent wheels, allowing an endless spectrum of combinations to be created. For even more variety, there’s also a rainbow and gobo shake effect. 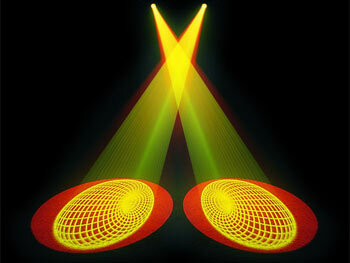 The fixture can pan a full 540 degrees and tilt 270 degrees, sweeping its effects across an entire venue. A high-velocity fan keeps it cool enough to run continuously without need for on/off duty cycles. Other features include a 13 degree beam angle and high quality micro stepper motors for smooth, precise movements. The unit weighs an easily manageable 13kgs and has the following dimensions: 373 x 295 x 451mm.